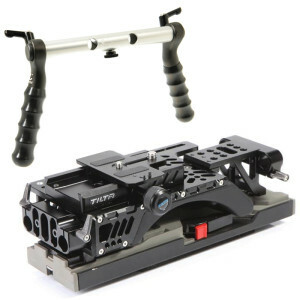 The Tilta camera rig is a really useful addition to any available DSLR or small to medium sized camera. It gives you a shoulder mount and a Sony style quick release tripod mount. The V-Loc batt power plate gives you various voltage power outputs plus a 12v D-TAP. Please note it is possible to force D-TAP connectors in the wrong way round which can kill equipment. We have labeled the polarity for this reason so you can clearly see which way you should plug things in.